Size: Just right for my needs, whether preaching, teaching, or personal study. It truly is ultra thin. Feels good to hold. I was concerned about a too large of a Bible for longer term holding or too small and harder to read. This is right in between for my kind of use. Print: The print is 9.5 which is definitely readable. There is a slight bleed through, but not distracting for reading. (the photos make the bless worse than in real life). Design: About what I would expect from such a Bible. 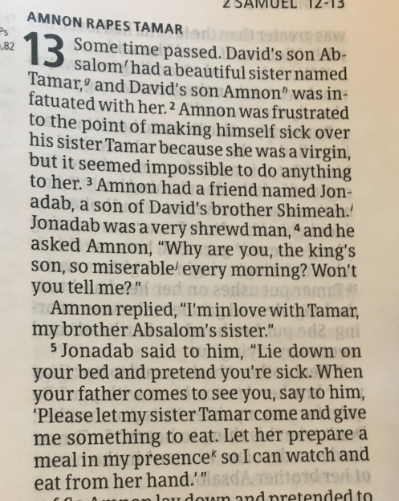 There is a problem with alignment at 2 Samuel 12. Notice how the margin of the text does not move out to the left after the drop cap 12. Notice in comparison how the left margin correctly moves outward after the drop cap 13. I am eager to explore this Bible more. So far, this Bible meets many needs that I have as pastor and teacher. As I use it more, I will also be checking translation choices, oral comprehension, etc. I have considered Bible translations for the past 30 years. Obviously solid translations handle issues in all these areas: words, phrases, syntax, linguistics, etc. Another area that is important to help the reader (silently or orally), which is not a translation issue per se, is the layout of the translation. 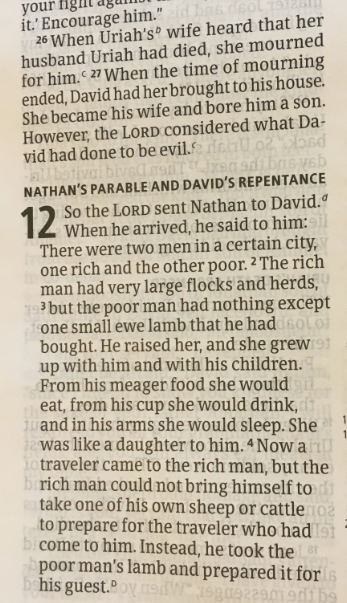 I think God’s Word translation has the best layout design of any translation (including using only one column). See here for a discussion of layout, aural connections, and readability be sure to read comments). In the same region there were some shepherds staying out in the fields and keeping watch over their flock by night. And an angel of the Lord suddenly stood before them, and the glory of the Lord shone around them; and they were terribly frightened. But the angel said to them, “Do not be afraid; for behold, I bring you good news of great joy which will be for all the people; for today in the city of David there has been born for you a Savior, who is Christ cthe Lord. Layout and design do make a difference, and that has been an issue especially noticed in the print era. For more formal equivalence translations, I like NAS and NKJV (much better than ESV) and have used both translations in readings this past year and for sermons. However, both use a layout scheme that can be confusing for reading. In poetry sections, both translations use capital letters to begin each line, regardless of the preceding punctuation (if any punction). And neither translation uses indentation to help the reader. Note this example from NKJV for Psalm 49. NAS has the same problem. As I have been reading and using MEV, I noticed almost immediately the different layout that MEV uses with regard to each of these problematic areas. 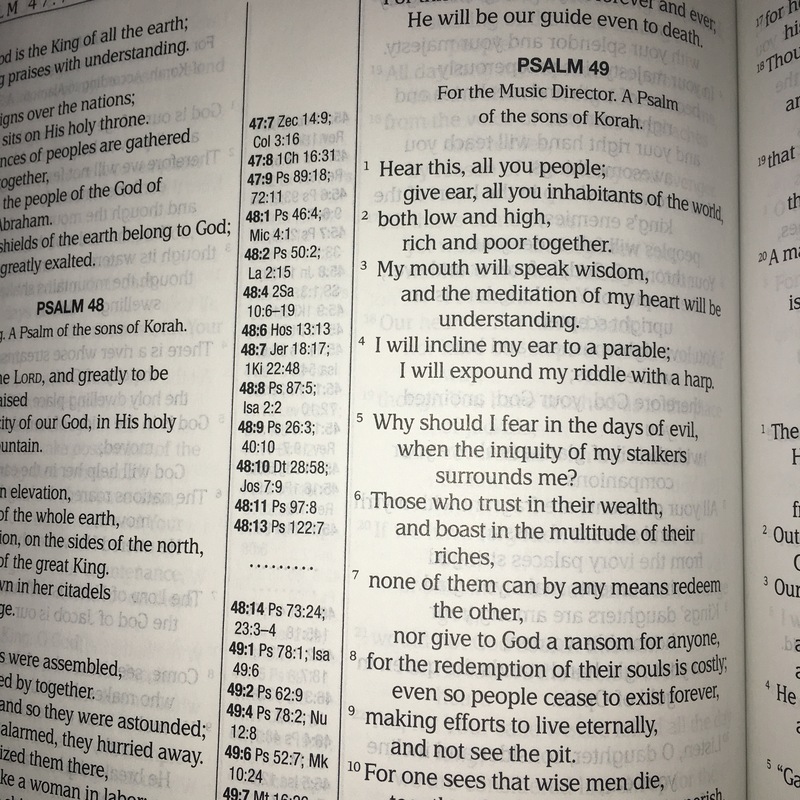 Here is the same Psalm 49 in MEV. The lack of capitalization and the indentation makes it easier to read and follow with the eyes. Despite the better layout of the MEV, there is a problem with the layout, in terms of paper weight and bleed-through (NKJV has same problem). Notice in the both photos that the print from the other side shows through. Keep in mind, that it appears worse in the photo below than in real life. But with MEV’s smaller font size, the bleed-through becomes more noticeable. Here is an enlarged view of the same MEV passage. I will have more comment son MEV translation this coming week. Overall, I can say that I am very pleased with it. My wife and I have used it for our nightly devotional reading the past two weeks. Further, we will use MEV for our readings for Christmas Eve and Christmas Day. There is a familiarity with rhythm and cadence. At the same time MEV has improved some of the words choices (better than NKJV).